Steven Rosengard, from the three-time Emmy-nominated competition reality series Project Runway seen on Bravo. 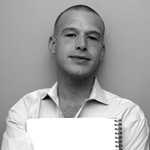 Steven Rosengard began designing at an early age. This passion led him to independently study fashion history before attending Columbia College's Fashion Design Program. Several years later he studied Dutch and Translated Literature at the Universtiy of Wiscosin-Madison. Rosengard currently works at the Museum of Science and Industry Chicago, as an Assistant Curator of Textiles and Plastics. In addition to appearing on the fourth cycle of Bravo's hit show, Project Runway, he also runs a small custom clothing design business in Chicago. Graduates of the Design Art program at Concordia University, Montréal, Québec, Julie and Josiane met and merged in 2004. While expressing the hopes and nightmares of their uneasy contemporary world, they met and involved Elio Bidinost, Computation Art Student at Concordia, and so eased their electronic concerns. Joanna Berzowska is Associate Professor of Design and Computation Arts at Concordia University, Montréal, Québec, a member of the Hexagram Research Institute, and the founder and research director of XS Labs. Her art and design work have been shown in the Cooper-Hewitt Design Museum in NYC, the V&A in London, the Millenium Museum in Beijing, the Australian Museum in Sydney, NTT ICC in Tokyo, and Ars Electronica Center in Linz among others. She was recently selected for the Maclean's 2006 Honour Roll as one of "thirty nine Canadians who make the world a better place to live." Elio's main interest lies in exploring and experimenting the relations between humans and machines. His work combines software and electronics into immersive installations, interactive video, interactive electronic sculptures and experimental interfaces. Elio will graduate from Concordia University in 2008. Jenny Chowdhury is a New Media Artist who likes to do funny things with electricity. She is a resident researcher at NYU's Interactive Telecommunications Program, researching wearable technology and physical computing. Jenny holds a BS in Electrical Engineering from Tufts University and a Masters from NYU/ITP. Elena Corchero spent her childhood at her mother's fashion studio and studied Fine Arts. She joined MIT's Media Lab Europe and specialized in smart textiles and wearable technologies. She recently completed an MA in Design for Textile Futures at Central St. Martins College and is currently a research fellow at Distance Lab. Jodi Finch is a Yoga, music, and art teacher at a local preschool. She's worked in many different art mediums such as clay, paint, and fabrics. She's moved by the affectionate interaction she sees between children. She wishes our society could learn more social grace when it comes to physical contact. Karen Fleming, Aoife Ludlow, Duncan Neil, Emma McClintock (Interface, University of Ulster, Ireland) and Professor John McLachlan (University of Durham, England) are a science and art co-operative exploring the use of textile structures in anatomy education. Mariana Ibanez is Assistant Professor of Architecture at the Harvard University Graduate School of Design. She teaches in the architecture core design studio sequence. Grace D. Johnston is a fashion design major at the VCU School of the Arts in Richmond, VA. For the past ten years, Grace has been designing and creating clothing from thrift-shop finds, vintage dress patterns and her own imagination. She has worked in costume shops, theater companies and her own living room making clothing and costumes for herself and others. She would love to thank her amazing family and fantastic friends for their never-ending support and continuous praise. Dana Karwas is an architect specializing in new media and her projects investigate the relationship between art, architecture, and technology. Dana has taught classes at Columbia University's Graduate School of Architecture, Harvestworks NYC. She is currently an adjunct assistant professor at NYU's Interactive Telecommunications Program. Karla Karwas is a NYC-based architect. Her work resides in an expanded architectural context, questioning the relationship between object and environment as well as the spatial influence of new media. Recent projects include Modular 3, a modular home that received Architecture Magazine's Home of the Year Award 2007 and The Yurt, a travelling installation done in collaboration with Columbia Graduate School of Architecture. Farida Kebaili is a Paris based designer and illustrator. Her works are focused on combining contemporary sensibilities and materials with traditional cultural influences. Born in Texas, raised in Indonesia and France, Nadra Kebaili is a New York based freelance art director, illustrator and graphic designer who enjoys bouncing between different media. Her interests have lead her to collaborations with clients that span the geographic and creative world -- be it fashion, music, fine art, architecture or photography. Her work has been shown in the Cooper-Hewitt National Design Museum. She often works by the glittering light reflecting off her collection of disco balls. Simon Kim is a post-grad Research Assistant at the Massachusetts Institute of Technology. He is pursuing research in architectural design strategies using input/output sensor technologies. Markus Kison studied physics and IT at the University of Ulm in Germany. He is currently in the Digital Media Class of Prof. Joachim Sauter, Prof. Jussi Ängeslevä and Prof. Kora Kimpel at the University of the Arts Berlin. His work has been shown at ZKM (Karlsruhe), Ars Electronica (Linz), Tokyo Metropolitan Museum of Photography and at the SESI Gallery (São Paulo), among others. Magdalena Kohler was born in 1982 in Wels, Austria. After finishing a goldsmith apprenticeship, she worked as a freelance jewelery artist in Austria. Since 2004 she has been studying fashion design at University of the Arts in Berlin, Germany, in the class of Valeska Schmidt-Thomsen. For more than ten years Leif Krinkle has been collaborating with artists, musicians and designers from around the world, developing multidimensional media and challenging the potential of traditional art forms. In 2000 Leif created Krinkle New Media, a production company specializing in interactive sound and video production. He has since produced albums for internationally acclaimed musicians, designed multimedia performances, and engineered interactive installations. Today Leif is fabricating musical robots, designing large nonlinear display systems, and engineering physical devices for interaction with immersive multimedia environments. Adam Kumpf is a masters student at the MIT Media Lab working on a range of projects that involve music, product design, mechanics, programming, circuitry, and the creative process. While eager to build circuits and write code, he is most interested in exploring art, human expression, and the wonderfully simple interactions that people experience everyday. Ebru Kurbak is a lecturer and researcher at the Department of Space and Design Strategies in Kunstuniversität Linz in Austria. She received her MSc Degree in architecture from Istanbul Technical University. Valérie Lamontagne is a Montreal-based performance and digital media artist, freelance art critic, and independent curator. She received an MFA from Concordia University, Montreal, where she presently teaches in Design and Computation Arts. She is a co-founder, with Brad Todd, of the media arts collective MobileGaze and is presently a Ph.D. candidate investigating "Relational and Ubiquitous Performance Art." Barbara Layne is an artist, a professor at Concordia University, Montréal, Québec and the Director of Studio subTela in Montréal, Québec. As part of the Responsive Textiles research group at the Hexagram Institute, subTela operates at the intersection of textiles and technology. Project assistants include Hesam Khoshneviss, Diane Morin, Maryam Golshayan and Meghan Price. Vincent Leclerc mixes inductors and bread dough in the hope one day to create a crusty 802.11 baguette. He spends most of his time steering electrons at ESKI, stitching circuits at XS Labs, and teaching physical computing at Concordia University in Montréal, Québec. Artist Jae Rhim Lee‚Äôs work draws on interests in psychology, thanatology, environmental sustainability, eastern religion, and disaster management. Her previous work includes customized beds and body waste recycling units for self and environmental sustainability. She currently teaches in the MIT Visual Arts Program (of which she is an alum) and is a consultant for the City of New Orleans Office of Recovery Management. Hatti Lim is interested in experimenting with more ubiquitous forms of sustainable technology. She graduates from NYU's Interactive Telecommunications Program this May and holds BLAs from the University of Notre Dame in Developmental Economics and Film/Television production. Trained in fashion design at Central Saint Martins College of Art, London, Di Mainstone's eccentric style caught the attention of press during a design partnership with cult UK labels Soochi and Choosi. Her fashion soon became a favorite of celebrities, selling internationally at boutiques such as Harvey Nichols and Urban Outfitters. Further design collaborations include illustrations at Jimmy Choo, accessories and homewares at Urban Outfitters, and prints at Topshop. Her interactive couture has been exhibited internationally. Laura Moore is an Adjunct Associate Professor of Fashion Design at Pratt Institute. She brings to the team her skills in patternmaking technology and apparel fit. Laura also makes patterns for and provides consulting services to designers and apparel manufacturers. She recently designed and fabricated a Trompe L'oeil Persian rug in 3/4" ceramic tile in her Manhattan studio. JooYoun is an artist and interaction designer born in Seoul, Korea, and based in New York. She has created interactive objects that reflect on human behavior, technology and social change. She earned a Master's degree from the Interactive Telecommunications Program at NYU and is currently an Artist in Residence at Eyebeam. For the past six years, JooYoun's art has been displayed and appeared in publications around the world. Amanda Parkes is a designer currently working toward a PhD in the Tangible Media Group at the MIT Media Lab with a research focus on kinetic textile interfaces. Before joining the Media Lab, Amanda developed exhibits at the Exploratorium in San Francisco, and installations and programs for the Science Museum in London and the Peggy Guggenheim Collection in Venice. She holds a B.S. in Product Design and a B.A. in Art History from Stanford University and an M.S. in Media Arts and Sciences from MIT. Outside the lab, she likes to sew, surf, and amass exquisite shoes. Rehmi has been combining electronics and textiles for over a decade since he first learned how to sew circuitry into fabric. His focus now is to extend the design language of e-textiles to scalable architectures for distributed computation, sensing, and power. HIs fondest hope is to discover a killer app for smart clothing. Raised by a pack of hippies and midwives, JjJJjjjJ Silver has been a go-go dancer, a Taco City bus-boy, a statistics professor, The Krazy Ice Kream Man, and a Yoga instructor. Now he designs for Skin-to-Skin Contact and Urban Exploration in the Life Long Kindergarten at MIT's Media Lab. Alice Tseng-Planas has collaborated with artists, designers, and technologists to realize projects ranging from public festivals to the intimate space of conversation over the kitchen table. From micro-radio salons to wearable technology, participatory engagement is where she situates herself. Her activities and projects examine the relational space -- encouraging dialogue and uncommon encounters is her favorite preoccupation. With her company Asteism, Kit is trying to create an electronics assembly factory out of knitting needles, a spinning wheel, and her grandmother's sewing machine. She's been known to annoy polite company by insisting that ridiculous ideas in technology are only impossible until making a trip to the fabric store. Hanna Wiesener was born in 1981 in Potsdam, Germany. From 2000 to 2004, she studied cultural studies and art history at Humboldt University, Berlin, and in Paris. Since 2004 she has been studying product design and interactive systems at University of the Arts, Berlin, in the class of Burkhard Schmitz and Frank Fietzek. Mahir M. Yavuz is a lecturer and researcher at the Department of Interface Cultures in Kunstuniversität Linz in Austria. He received his MFA degree in visual communication design from Istanbul Bilgi University.